It's time to find a preschool or child care provider and you're completely overwhelmed, right? Online data offers a wealth of information about public and private elementary schools, but finding a quality preschool can be more challenging. In this article you'll find tips to help you when you begin choosing a preschool or child care center for your child. Start by considering your family's needs and budget. Do you need a full-day preschool program with extended care, or is a half-day preschool program sufficient? Are you looking for a program with a particular educational philosophy? Would your child be most successful in a center or a small home setting? Once you've articulated your wish list, you're ready to start actively looking. Ask for referrals. Talk with your pediatrician or close friends to get their opinions. Ask them specific questions about a preschool program's philosophy, reputation, teaching staff, and curriculum. Once you've narrowed the search down, it's time to visit the schools. Pay attention to that first impression. Parents' intuition is usually right. How do you feel when you walk in the door? Is the space clean, bright, and inviting? Do you feel welcome? Learn about accreditation programs. Many child care centers and preschools participate in voluntary accreditation programs, such as the one offered by the National Association for the Education of Young Children (NAEYC). Not all high-quality preschools have the resources to go through these rigorous programs, but preschool accreditation does offer an added measure of reassurance. Consider the preschool teachers' qualifications. What qualifications do the teachers have? Do they participate in ongoing trainings? How do they interact with the children? How do they handle guidance and discipline? Ask about the curriculum. Philosophies and curricula vary widely from one preschool to another. 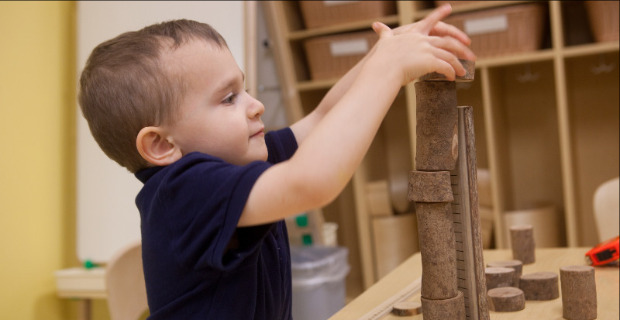 Look for a preschool curriculum that offers rich content, hands-on learning, and developmentally-appropriate play. Does the curriculum address fostering social and emotional development as well as academics? Children should be actively engaged in learning. Visit the outdoor space. Outdoor play has taken a back seat to academics in recent years. This trend, which began in elementary schools, is trickling down to preschools. Yet, children's needs haven't changed and outdoor play is still as important as ever. Make sure your preschool provides plenty of time for outdoor play and exposure to nature. Look for signs of community. Your family will probably spend a lot of time at your preschool; it will become a place of community, where parents, teachers, and children support each other. Does the preschool offer any events or programs to foster close relationships? Read the fine print. Be sure to read the parent handbook before you enroll. Find out about the school's hours, tuition rates, registration fees, and illness and vacation policies. Do the policies seem fair to all parties? Bottom line: ask questions, trust your gut, and follow up. You may want to consider using a resource like the Bright Horizons Quality Preschool Checklist. Even after you've chosen a high-quality preschool, it's important to stay involved. Volunteer occasionally. Work to build open communication with teachers and staff. Listen to your child’s observations about school. Discuss any concerns promptly with your child’s teacher or the preschool director. Remember, you're making an investment in your child's well-being. Spend time thoughtfully choosing a preschool and build strong relationships with the center staff thereafter. We invite you to visit us during our Preschool & Kindergarten Prep Preview to explore our preschool and kindergarten prep classrooms, engage with our STEM curriculum, and connect with our educators; all while learning how Bright Horizons ensures children are on the right track for school success. This event is open to both adults and children, walk-in's are always welcome, and there is no need to RSVP.